As the A.A. Milne poem goes, “the daffodil, in her yellow sun bonnet, whispered to its neighbors: ‘winter is dead.’” Just like that, the season’s proud, perennial patron rallies nature’s troops for the march into this season of rebirth. The daffodil has certainly earned its distinction as spring’s quintessential flower. Not only are daffodils among the earliest to bloom, they are also among the easiest to grow—and some of the hardiest, too. Because of its ability to fend off chilly weather that most years, lingers longer than we like, the mighty daffodil leads the charge among the first flowers of spring. Even a surprise, early-spring snow doesn’t ruffle the daffodil’s sturdy petals; cold weather stimulates budding. Daffodils are members of the genus Narcissus, whose shared design features a trumpet cup (the corona) surrounded by a ring of, typically, six petals (the perianth). Generally insect-, deer- and rodent-proof, daffodils are low maintenance. 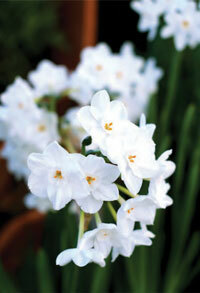 According to the American Daffodil Society, the steadfast bulbs can deliver delight well beyond our lifetimes. An estimated 30,000 varieties of daffodils exist around the world. Enthusiasts are so taken with the classic flower that they have worked tirelessly to develop hybrids with new and spectacular variations of color, petal and cup. Though not native to the U.S., the daffodil, thought to have originated in countries around the Mediterranean Sea, grows well in most parts of the country and worldwide, making its appeal near-universal. Serious daffodil growers across the globe form lasting bonds as they gather at daffodil shows, conferences and festivals large and small. Janet Hickman is a local gardener who has taken her love for the flower to daffodil shows in several states; she serves as a competition judge and member of the American Daffodil Society’s board. The Lynchburg resident certainly knows a thing or two —actually, 1,800—about the daffodil; that’s how many varieties she is growing currently in her yard. For some varieties, she has planted several bulbs; others stem from a single bulb. All of them are meticulously labeled. Her daffodil beds are aptly described as showcase and laboratory; hers is no mere garden. Growing daffodils offers great rewards for gardeners regardless of expertise, from the novice grower who spiffs up a mailbox with a few simple blooms, to the advanced gardener with time and energy to lavish on abundant and intricate beds and borders. Daffodils do best in areas that receive at least six hours of sun. When choosing the perfect garden spot to show off their prettiest sides, keep in mind that as they grow, daffodils turn their trumpets toward the sun. Bulbs are relatively inexpensive and readily available in stores and in bulk, through catalogs and online sites. Hickman recommends buying from businesses that specialize in daffodils. When shopping for bulbs, the same wisdom applies to daffodils as to other flowers: the bigger the bulb, the better the chance for bountiful blooms. Varieties range from classic yellows and whites, to those more modern and whimsical. Daffodils are classified in 13 divisions based on their varied characteristics: daffodils in Division One, for example, have long trumpets; in Division Six, the flowers’ petals bend backward. Many varieties have amusing and creative names; choose those that suit your fancy, or encourage your children or grandchildren to do the choosing, then help them plant and care for their very own daffodils. 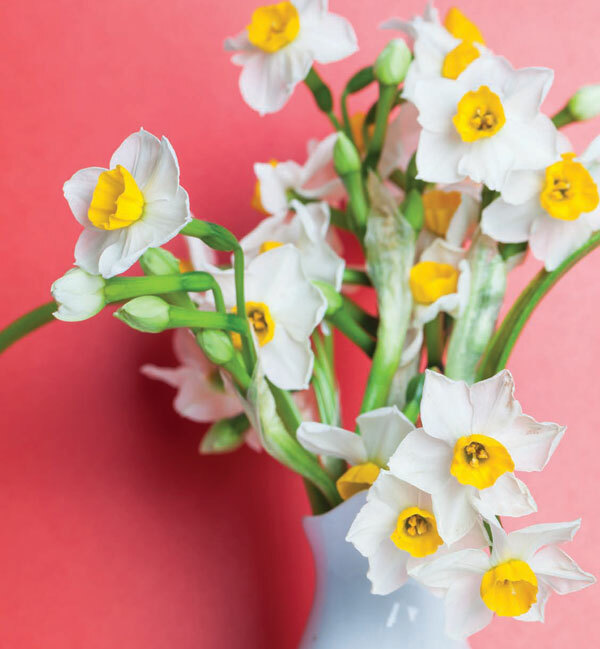 These flower names might be synonymous to many people, but technically, jonquil refers to a certain division of daffodils that usually have more than one flower per stem and carry a lovely, sweet scent. 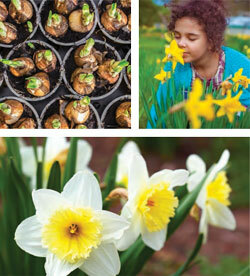 To explore the many varieties of daffodils and discover your favorites, attending a daffodil show can be great fun. Two large shows are planned at Lewis Ginter Botanical Garden in Richmond, Va., in March: The Garden Club of Virginia will host Daffodil Day on March 26; Virginia Daffodil Society’s show is scheduled for March 30–31. Not all daffodil varieties bloom first thing in spring; they can vary in their blooming times, in early-, mid-, or late-season. Some outliers can even grow in late fall. 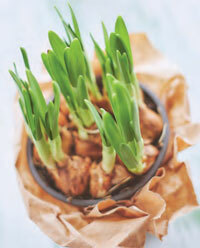 Daffodils thrive in porous soil with proper drainage. Here in Central Virginia, bulbs do best in looser, more nutrient-rich soil. They won’t thrive in the compacted clay soil that can bedevil local gardeners; further, soil may need to be enriched with peat moss, sand, or even dirt brought in from a nearby wooded area. Daffodils should be planted in the fall, two to four weeks before the ground freezes, when the soil temperature is about 50 degrees. Old Farmer’s Almanac recommends spacing the bulbs 3 to 6 inches apart and covering with at least 6 inches of dirt. The flowers can be watered in the spring and during a dry winter, but they should not require any water in the summer when they are dormant, since too much water—if they’re placed near a lawn sprinkler, for example—can cause the bulbs to rot. There is also no need to fertilize them. After daffodils bloom in the spring, they should be left alone until they die off, since they need time after blooming to store energy in the bulbs for next year. Successful gardeners resist the temptation to cut back foliage until it turns yellow, never cut them down to the ground entirely and disguise faded foliage with laterblooming perennials planted nearby. We’ve all driven past an old farm on a pretty spring day and noted a dilapidated house or falling-down barn. A closer look into the overgrown, dead brush, however, might reveal clusters of bright yellow and white—staunch and steadfast daffodils standing tall amid the rubble. “Survivors” is what Hickman calls them. “These daffodils are likely the older, classic varieties, as hybrids really took off after 1940,” she explained. Daffodils are so long-lasting because of their natural ability to reproduce bulbs underground; a single bulb can propagate into clusters from the stem—called “bulbets—each of which develop into bulbs in just a few years. A careful gardener can help this process along by digging up and separating the clusters, giving them more space. (This is also why daffodils thrive in looser soil, as it gives them breathing room to do some of the separating on their own.) When the bulbs are dug up, divided and replanted, the smaller bulbs reach a viable size more quickly and produce more blooms. In this process, some bulbs might “hook together.” Growers should resist pulling them apart; doing so can leave a vulnerable bare space in the bulb, hospitable to pests and disease. As attractive as they are, daffodils do come with a downside: the Narcissus family can be poisonous to pets, which should be kept clear of the tempting flower. If, like my children, you can’t resist bringing nature’s beauty inside, you’re in good company. The best time to cut daffodils is in the early morning or evening, as nectar is moving most actively through the stalks at those times. Stems should be cut to the ground, but foliage should be left in peace; remember, foliage feeds the bulb for next year’s blooms. Stem ends should be cut on the diagonal so they don’t curl up in the vase; water should be room-temperature and changed often. Like tulips and many other bulbs, daffodils can be “forced” to bloom indoors during the off-season. Particularly easy to force is the paperwhite variety, popular at holiday time and without need of a period of cold to “shock” or set a bloom. 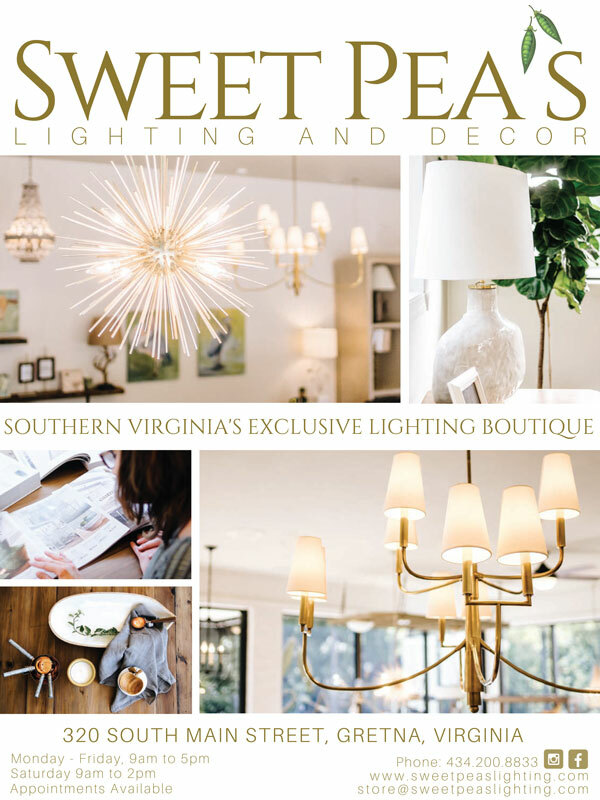 HOME would like to thank Hillside Garden Club members Janet Hickman and Janie Vaughn for their contributions to this article. Daffodilusa.org is the official website of the American Daffodil Society, with growing tips and a wealth of information on daffodils. The society also offers services for daffodil enthusiasts at Daffnet.org. Search a database of varieties by specific characteristics at Daffseek.org.